Eternity may be relative when it comes to the fate of those who are laid to rest in the Beecher Mausoleum. The Will County historic landmark, on Cemetery Road east of Dixie Highway, has been brought back from its near state of disrepair by a woman whose family history dates back to the mausoleum’s inception. But, she said, without the help of the community, the building will once again fall by the wayside, causing concern for the future of the 171 occupied crypts. A special meeting to discuss the future of the mausoleum is scheduled for 7 p.m. Monday at the Washington Township Center, 301 E. Indiana Ave.
“It was a beautiful, grand, regal structure with white marble interior and Bedford stone exterior with stained glass windows,“ Sandra Lee Thielman said. Thielman is a descendant of six people who are laid to rest in the Beecher Mausoleum, including her grandparents, her great-grandfather was one of the founders of the Beecher Mausoleum Construction Co., which fashioned the building after a similar mausoleum in Crown Point, Ind. 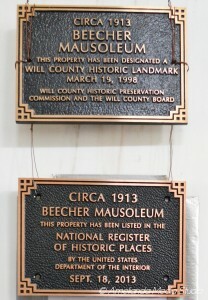 According to the Will County Historic Preservation Commission, the building was completed in 1913. Thielman said it was once a place that she was proud to have her past associated with. But after her family moved to northern Illinois, she had not visited the site for many years and was shocked to see the damage that was done by vandals. “I was truly horrified,” she said after seeing the mausoleum in 1997. She sent more than 600 packets of information in a plea for help across the country, securing $16,000 for cleanup and repair of the building. Thielman, who lives near the Wisconsin boarder, has made countless trips to the mausoleum to acid wash the exterior of the building to restore its original color. She scraped and repainted the interior ceiling, cleaned up the landscape, hired a professional tuck pointer and made artificial marble slabs to replace those that were broken on the crypts. Along the way, Thielman secured Landmark status for the mausoleum to ensure there would be no changes to the original architecture and design. It also ensures the mausoleum cannot be demolished without court action. But over the years, the mausoleum has continued to slowly deteriorate without the constant upkeep that the 92-year-old landmark requires. Thielman said there are many more things that need to be replaced such as some interior marble and stained glass windows. However, they are costly and there are no funds or a local committee to watch over the building. Thielman said the crypts originally were sold for approximately $200 each, with the understanding that $5 would be set aside for perpetual care. She said through her research she only has found one family that donated $5000 to the perpetual care account. “I Have carried the burden since 1997 and I cannot carry it alone anymore,” Thielman said. She said in a worse-case scenario, the mausoleum would fall to such a state of disrepair, the county would demolish the building, but before doing so, descendants would have to be notified, the crypts would have to be opened and the remains would have to be buried elsewhere. The mausoleum sits outside the village limits of Beecher, in Washington Township, and is not affiliated with any one church. Thielman approached Beecher Mayor Paul Lohmann, asking him for help in a efforts to ignite the community’s concern. “I want to get cooperation from various churches and township people to set up a funding source and set up a commission or board to govern it, to make sure the never happens again,” Lohmann said. “It’s not in the village limits, but I will try to get pastors and chairmen of different churches to have parishioners that are laid to rest there, and get the county and township board members to see what we can do to resolve this issue.” Lohmann said. Washington Township supervisor Nelson Collins said that while the mausoleum is within the township’s borders, it is not the governing body that is responsible for the building. “If they did accept the responsibility, there would need to be some funding and that can only be done by referendum, and I don’t know how willing the voters would be to maintain a mausoleum,” Collins said. However, Collins said he is looking forward to Monday’s meeting and learning more about the mausoleum’s history. This entry was posted in Automated Article Listing, Historical Information, Newspaper Articles by Sandra. Bookmark the permalink.